Western Union Telegraph Company, 1881. James Gamble was a pioneer in building the first telegraph lines on the Pacific coast. He started his career in 1848 as a telegrapher in Hannibal, Missouri after spending thirty days of training in St. Louis. 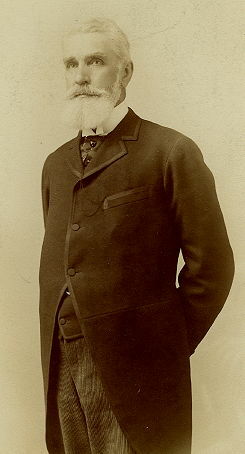 He soon after moved to Illinois where he became the manager of the telegraph offices located in the cities of Quincy, Chicago, Jacksonville, and Alton. All of these offices were part of Judge John D. Caton's Illinois and Mississippi Telegraph Company. While at Alton, he was also the editor of the Alton Daily Courier before moving to California in the early 1850s. In 1881, after several years working in the telegraph industry on the Pacific coast, Gamble documented his experiences building the first telegraph lines in California and the western section of the U.S. transcontinental telegraph line in two superb articles for "The Californian" magazine. His first article,"Early Reminiscences of the Telegraph on the Pacific Coast," is shown on this page. This article was also published in the Western Union Telegraph Company publication, "Journal of the Telegraph," that same year. A lot has been documented about the first telegraph line on the East coast between Washington, D.C. and Baltimore. In Gamble's first article, he documents the building of the first telegraph line between major cites on the West coast. In 1901, smaller, edited versions of both articles appeared in "The Telegraph Age" under one title, "When the Telegraph Came to California." This title is appropriate for the overall subject of Gamble's work. The articles shown on these web pages are the original, unedited versions from the "The Californian" magazine. The images with captions have been added. The original articles published in both 1881 and 1901 were all text. Many historians have used Gamble's articles as a source when researching this period, including author Robert Luther Thompson, who, in 1947 also used Gamble's title, "Wiring A Continent" for his book. After reading James Gamble's articles, I think you will agree with the opinion of "The Telegraph Age" that, "what he has to say is not merely interesting as a recital of adventure and enterprise, but, coming from such a source, it is telegraphic history pure and simple." The first telegraph lines in California. The making of the U.S. transcontinental telegraph line. 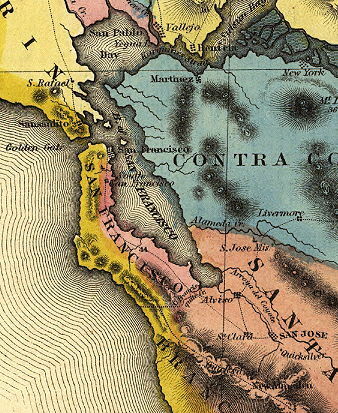 D uring the early period of its history, say from 1849 to 1853, California was isolated from the rest of the world, there being no telegraphic communication on the Pacific coast whatever. The first movement to put a line of telegraph in operation was made in 1852, when Messrs. Allen and Burham obtained from the Legislature of California a franchise giving them the right to operate a line between San Francisco and Marysville, via San Jose, Stockton, and Sacramento, for the term of fifteen years - this right to be exclusive, provided that the line was completed by the first of November, 1853. The company was organized under the name of the California Telegraph Company; but, owning to disastrous fires in 1852, it was found impossible to carry out the construction of the line under the first organization. In 1853, the company was reorganized, and called the California State Telegraph Company. The stock was fully paid up, and the directors, in order to secure the charter, energetically set to work to complete the line within the time specified in the original franchise. W.B. Ransom was appointed superintendent, and W.M. Rockwell, who for many years after was a prominent hardware merchant in San Francisco, had the contract for construction of the line. I had at that time just returned to Sacramento from the mines, where I had been trying my hand at mining, and by accident met Mr. Ransom, who learned from my conversation that I was a practical telegrapher, and immediately engaged my services to take charge of the wire party then fitted out at San Francisco. I at once left for that city where, on my arrival, I took command of the men employed to string the wire, at the same time learning that the pole setters were already many miles in advance. The party numbered five besides myself - our means of transportation being the running gear of a wagon, on which were placed loose boards enough to carry our meager outfit. This consisted of a coffee-pot, small sheet-iron boiler, tin plates, tin cups, knives, forks and blankets. The wagon, drawn by a pair of well broken mustangs, in addition to carrying our camp equipage, served the purpose of carrying the reel and running out the wire. It was then the thirteenth of September, 1853, when work was commenced; and as the line had to be completed and in operation over a distance of two hundred miles before the first of November following (six weeks), there was no time to lose. Our little party worked energetically, and on the first day we strung up about three miles, camping for the night at what was known as the Abbey, a wayside house on the outskirts of the city. The next day we made about six miles, having commenced early in the morning and working until dark. The day had been a very foggy one, and as the country at that time was but sparsely settled, and but little land fenced in any direction, we found ourselves, when the day's work was over, lost in the fog. Toward the close of the day, and shortly before leaving off work, we had noticed, as we came along, a squatter's cabin, to which, having no tent with us, we had decided to return and seek shelter for the night. To find this cabin was now our great desire, that we might be protected from the cold winds and fog. Separating, but with the understanding that we should keep within hailing distance of each other, we groped in the dark and fog for more than an hour, but without success. The squatter's cabin seemed to be a sort of befogged �Will o� the Wisp"--with this difference, we were sure that it was there somewhere, but to save our lives none of us could find it. We finally determined to give up the search, roll ourselves up in our blankets, and make the best of it on the ground. In our eagerness to find the cabin we had overlooked our supper. This had now to be prepared. It took but a few moments to decide what it should consist of. Our larder was so limited as to dispose quickly of all controversy on that head. But simple as the meal was, it could not be prepared without fuel, and, while searching for sufficient wood to make a fire, one of our party ran up against the cabin we had so long and anxiously sought, and which all this time was within a few hundred feet of the spot we had selected as our camping ground. Worn out as we were with a long and hard day's work, the prospect so unexpectedly opened up of passing the night under shelter, and in the warmth of a cheerful fire, was received by all with feelings of unlimited satisfaction. A kind-hearted squatter received us most hospitably, and welcomed us to the shelter of his cabin, which our party, small though it was, completely filled. Coffee was soon made, and this, with some canned meats and vegetables, soon satisfied the inner man. A few minutes' chat sufficed to tell the news of the day, and, then, rolling up in our blankets, we sought and quickly found a well earned repose. All this to me at that time was, in reality, but little hardship. My journey across the plains had thoroughly broken me in to the roughness and simplicity of camp-life, and as I stretched out that night, and often afterward, in my blankets on the �soft side of a plank,� I enjoyed a rest rarely experienced by any even when surrounded by the greatest luxuries. The next morning we made an early start, breakfast being finished before daylight. There was no eight-hour law at that time, and as the work had to be pushed forward rapidly, our time was from daylight to dark. In these days we put up from five to seven miles of wire a day. On the fifth day out we reached a ravine known as the Canada Diablo, near what is now Belmont, and the site of what was afterward noted as the Ralston mansion. Here the first attempt was successfully made to open up communication by telegraph with San Francisco. 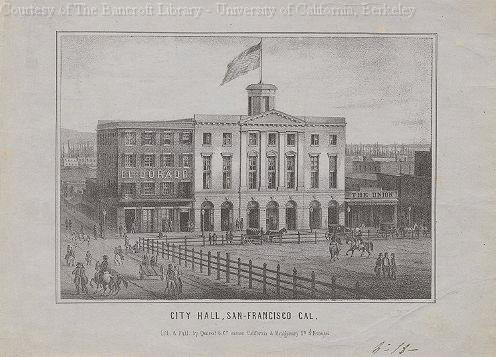 On testing the line I found a good current from the San Francisco battery, and, after having connected my instruments, placed myself in direct communication with that office, then established in what is now the old City Hall. This was the first message ever transmitted on the Pacific Coast over a telegraph line. After this, regular communication was opened up every evening between our camp and the city, and the progress of the work reported. The telegraph at that time was a source of great curiosity to almost every person along the route, particularly to the native population, who looked upon the construction of the line with the greatest wonder. Many of them in ignorance of its real purpose and not understanding the use of the poles erected along the road at regular intervals, strung with wire with a cross arm on each pole, conceived the idea and expressed it as their belief that the Yankees were fencing in the country with crosses to keep the devil out. After having fully equipped the office at San Jose for business and placed it in regular telegraphic communication with San Francisco, I prepared to push on the next day for Stockton, when, just as we were on the point of starting, I discovered that the coils of wire that had been I stored at San Jose were much larger than those we had used between San Francisco and that point, and were consequently more difficult to handle without changing the reel. We made only three miles that day, camping at night in front of a farm-house, the occupant of which had left the Eastern States before the advent of the telegraph. When supper was over he visited our camp and appeared much interested, watching me attentively while I was communicating with San Jose and San Francisco. He could not realize that it was possible for me to hold a conversation, through the medium of a little ticking instrument, with persons so far distant. In fact, he expressed grave doubts as to the truthfulness of my assertion that I was speaking with any one at all, saying that it was impossible for any one to read or interpret the clicks made by the little instrument in front of me. And so satisfied was he of the correctness of his views that he stated his willingness to back them up by a wager. He then requested me to tell him what it was I had just communicated. I told him I had informed the operator at San Jose that the machinery I was using for paying out the wire needed some alterations, and that I would return there the next morning to have the necessary changes made. He thereupon very kindly volunteered on certain conditions to take me to San Jose in his wagon. The conditions were that I would accept his offer to furnish watermelons for the whole party on its being proved that the communication I had stated as having been sent by me to San Jose had been received at that office over the line. But to make sure that no advantage should be taken of him, he requested me to send another message to the effect that on our arrival at San Jose in the morning the operator must promptly appear at the door of the office and say "Watermelons." My agreement to do this seemed to increase the interest my rancher friend held in me, and he very generously tendered me the hospitality of his house, in which I enjoyed the luxury of an excellent bed. After a hearty breakfast in the morning, a good pair of horses were brought out and attached to a buggy, in which was placed my reel, and we started for San Jose. Drawing up in front of the office we were met by the operator at the door, who promptly saluted us with " Where are the watermelons?" My companion slapped me on the back, delighted at being fully convinced of the reality and importance of telegraph. The watermelons were quickly provided, and as they were worth at that time a dollar or more apiece, they were considered a great treat. When the feast was over, he made many inquiries about the telegraph, examining into the mysteries of its working; after which, the changes in the wire-reel having in the meantime been made, we set out on our return to the camp, where, on our arrival in the afternoon, work was again resumed. beginning in September of 1853. Nothing worthy of note occurred after this time until we reached Sunol Valley in the mountains east of the San Jose Mission. On the night of our arrival there I was taken down with fever; brought on by fatigue and exposure to the night air and fog. I had not slept under a roof since leaving San Francisco, except in the few cases I have mentioned. Near the spot where we camped was a rough Mexican hut containing some two or three rooms, in one of which was a bar where liquors were sold, and principally patronized by the native population. There were none but Mexicans about the place, and not one of these understood my language. But notwithstanding this, I endeavored to make them comprehend that I was ill and desired a bed and shelter for the night. This, after some difficulty, I succeeded in doing, and one of them finally conducted me to a shed at the end of the building, where a cot was pointed out to me as my bed for the night. It was a rude and cheerless looking place, but feeling that even that was better than further exposure to the night air, I reluctantly accepted it. As it was already dark when I arrived at this point, I could see and judge but little of the surroundings; so after having arranged for my lodgings, I returned to camp in order to consult with my foreman for pushing on the work the next day, knowing well that while the fever lasted it would be impossible for me to accompany the party. I certainly felt little inclination to remain in the lonely and miserable spot that had been assigned to me as a bed, with no one near to whom I could speak or make known my wants. But it was a case of Hobson's choice-that or nothing. The choice was perhaps less inviting than the one presented to "Hobson," for it was in reality that or an aggravated fever. I realized the fact that the occurrence of the latter might not only endanger my life, but also the success of the whole enterprise, in failing to have the line built and in operation within the time prescribed. In addition to the loneliness of the place there was the uncertainty as to whether my life was safe with these Mexicans, there being at that time a good deal of ill feeling between the Americans and the native population, in consequence of the former squatting on lands supposed to belong to the latter. That these were no idle fears was established by the fact that but a few days previous we had learned of two Americans who had been lariated and dragged to death by the natives. The question, therefore, of my remaining alone with these Mexicans was discussed in camp with considerable feeling. None of us carried arms, and so were poorly prepared for defense in the event of any attack being made on us or any of our party. But as we were not in the land business I concluded there was no risk in remaining, and the fever from which I was suffering produced such a depression on me that, to tell the truth, my feelings were those of utter indifference as to where I stayed so long as I could obtain some repose. I, therefore, determined to accept the situation and make the best of it, taking the precaution, however, to hint to my party that if they heard any unusual noises in the night they had better be on hand. I then returned to my "hotel," where, taking a seat in the bar-room, I passed a couple of hours before retiring to my lonely cot in the comer the shed. During my stay in the bar-room several very ugly-looking natives rode up, their arrival announced by their jingling spurs. They would dismount, take their drink, smoke their cigarette, remount, and disappear in the dark. They were all well armed with pistol and knife, and seemed to me as cut-throat a looking lot as I had ever set eyes on. It is quite possible that my nerves, which, owing to the fever, were in a very shaky condition, may have magnified the look of villainy in the faces of those fellows, but the appearance of them, as they entered the room was not such as was calculated to inspire peace and quietness in the mind of one situated as I was at that moment. I could not, however, sit up all night, so at last concluded to go and make a more intimate acquaintance with my cot. And concerning that cot let me say a word more. I had a keen appreciation of what the upper side of a crockery crate was as a mattress; my trip across the plains had initiated me into the mysteries of what a sack off flour was a pillow; my early journeyings through California had made perfectly dear to me the very doubtful delights of a sand-hill as a bed; but that Mexican cot positively combined the tortures of all three. From that night I had, I think, a much clearer idea of the Spanish rack and Inquisition. On rising in the morning, the first thing I noticed, to my great surprise, was that I was in sight of a rather pretentious looking, new frame building, about which I observed signs of American civilization. It did not take me long to make a closer investigation of it nor to find out who were the occupants. They turned out to be a very clever Yankee, his wife and several children, with whom were quartered some carpenters engaged in completing the building only recently occupied by the family. I was welcomed to the house and provided with comfortable quarters, finding also there, what at that moment was of importance to me, a well assorted medicine chest. Concluding to remain there some days, until the fever was broken, I gave full instructions to my party to proceed with the work, and in the event of any unusual occurring to send back at once and let me know. The house was well furnished with fire-arms. It was, in fact, a small arsenal, there being rifles, shot-guns, and revolvers enough to arm the entire family, carpenters included; and, as the proprietor informed me, every member of it, down to the youngest child, knew how to fire and load, they were well prepared to defend themselves in case of an attack. This they were living in daily expectation of, having been notified by the natives that they must vacate the premises. As I afterward knew, they were never obliged to do this. The house contained too many rifles and revolvers to suit the native complexion. I remained with them two days, when, feeling stronger and improved in health, I began to investigate for some means of leaving, there not being any public conveyance through that part of the country. I was told that if I would go to Livermore's, some twelve miles distant, I would very probably be able, at that point to intercept teams traveling between Stockton and San Francisco -- they being obligated at that time to go through Livermore's Pass. 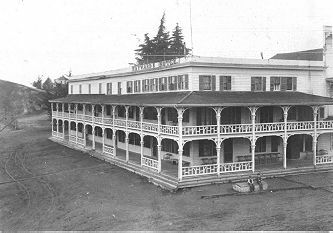 As there was no hotel at the place, my only chance of shelter, after reaching Livermore's ranch , was to ask quarters of him; and this, I was assured, would be promptly refused, as owning to his early settlement in the country he had become thoroughly Mexicanized. At that time,in 1853, he had already been in California over twenty years, had married a native and raised a large family. A Scotchman, I believe, by birth, it was said that in early life he was a sailor, and that the vessel in which he sailed been wrecked or he had been left on the coast. In any event he must have arrived here as early as 1830, for at the time of my visit to his place, in 1853, some of his children were already more than twenty-years of age. As it was necessary for me to reach Livermore's, in order to find there some conveyance that would take me to town, I looked about and found an old Texan, living at a short distance from the house of the American in which I had been made so comfortable. This Texan agreed, for a proper consideration, to take me in his ox cart, which was something after the style of Father Tom's curriculus, consisting of two wheels, with a platform delicately balanced, and drawn by a pair of oxen. It took us the entire day to make the distance to Livermore's ranch, which we reached as the sun was setting. I put on a bold front, walked into the house and called for the proprietor. As the employees about the place were all Mexicans and did not understand any English, it was some time before I succeeded in making known my wants. The old gentleman finally made his appearance, and desiring to know what I wanted, I introduced myself, stating who I was and the nature of my business. He took a general and very suspicious survey of my person. The "telegraph" to him was a mystery. He had seen the poles crossing his lands with many misgivings. Still, he had heard and read something of the telegraph, and now, that it had come so near to him, he became interested. He began questioning me as to its working, in a manner, I thought, rather to prove that I was not an imposter, trying to thrust myself upon his hospitality as many roaming miners had done in those early days. But when I exhibited to him the little box instrument I carried with me under my arm, he became at once very much interested, cordially inviting me into his house. Courtesy of the Hayward Area Historical Society. My old Texan friend, after seeing me safely ensconced, bade me "good evening" and prepared to turn his oxen's heads homeward, which he hoped to reach by midnight. The old fellow was well prepared for defense and said he had no fears of the road. I paid him a good fee for his services, and he left apparently well satisfied with his day's work. Being still feeble and with little appetite, I felt, when supper was announced, in poor trim for a regular Mexican meal, composed of jerked beef stewed with peppers and other spices, Mexican beans, and tortillas, a species of pancake something like what miners call "slap-jacks." Although Livermore was at that time considered one of the richest men of California, his lands comprising all the plains of the valley bearing his name, covered with horses and cattle to the number of some fifty or sixty thousand of which he was the sole owner, the interior and household arrangements were of the most primitive character. The food was badly served without a cloth, rude benches for seats, and although possessing thousands of cows there was neither butter nor milk on the table. After supper was over, I entertained the old gentleman with an explanation of the working of the telegraph, his wife, a full-blooded Mexican woman, and children making up the party. From time to time he would interpret my explanation to his family, none of whom understood a word of English. They all appeared greatly interested in what I had to say, and on separating for the night, it was with many kind wishes on his part that I should enjoy a comfortable night's sleep. At that period there was no land in the valley fenced in. Here and there could be seen a corral but nothing to show that the land was made use of except for grazing purposes. Livermore himself had none under cultivation with the exception of a small garden patch irrigated by a stream near the house. At a short distance from this I overtook my party, and, after giving further directions to my foreman, I decided to remain where I was until such time as I could procure a conveyance, or some means of transportation to San Francisco. This I was fortunate enough to obtain the next day. An acquaintance on his way back from Stockton kindly offered me a seat in his buggy. We reached Hayward's that evening and remained there all night, arriving the next day in San Francisco.